Would you not interpret it as “you can’t have a rule specifying a maximum height of less than 45 feet”, not “you cannot build anything shorter than 45 feet”? Instead of “requiring,” can we just start with “forbid not”? 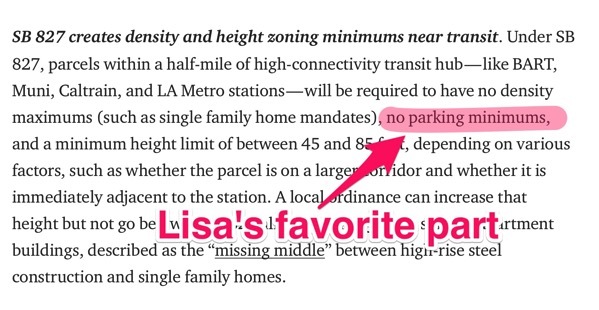 I think the intent of the “minimum height limit” language is to set a minimum on the height limit for the zone, not a height minimum for the zone. The language in that blog post is confusing, but I don’t think the legislation requires developers to build towers where there’s no demand for them. Presumably a city could zone for higher minimum heights if they did want to force developers to build bigger, but my reading of the bill is that it’s not doing that (see (4) (A) in https://leginfo.legislature.ca.gov/faces/billTextClient.xhtml?bill_id=201720180SB827).